As the state retreats from funding the arts, corporate power creeps in - only to find itself exposed by new alliances of citizens. 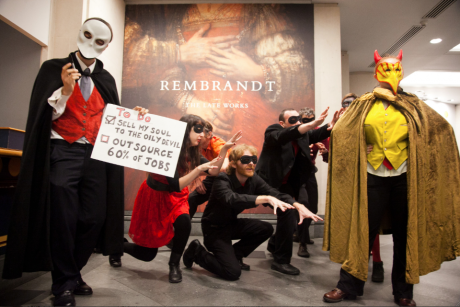 The National Gallery recently opened the doors to its new headline exhibition, ‘Rembrandt – The Late Works’, but by deciding to take on a private security firm and accept sponsorship money from Shell, the gallery had unwittingly opened its doors to a week of protest. A new alliance of climate activists and union members was about to emerge, intent on defending the arts from unethical sponsors and highlighting the gallery’s plans to privatise up to two thirds of its workforce. On Tuesday morning, respected arts journalists and critics had made their way to the gallery’s Sainsbury Wing for an exclusive press conference, launching the new exhibition. However, just as the press conference was drawing to a close, a group of ten “actor-vists” dressed in black and red began singing from the landing above. The group performed a Faustus-themed musical sketch, in which a gallery director is tempted by a “Shell-devil” offering oily money and sell-offs to private hands. In this version though, the gallery director sees the error of his ways and changed his plans at the last minute: ‘We’ll cut the cuts to national art; Culture, oil – set them apart!’ Journalists and gallery-goers gathered to watch the performance, which was met with applause, before the performers ceremonially kicked the Shell-devil out of the building. Oil sponsorship, Rembrandt & the National Gallery from rikki on Vimeo. The groups behind the performance, BP or not BP and Shell Out Sounds, are part of Art Not Oil, a coalition of groups that creatively campaign against oil sponsorship of arts and culture. From oil spills and gas flaring in the Niger Delta to carbon-intensive tar sands projects in Canada, Shell are an extremely unethical choice of sponsor. Their continued lobbying against climate legislation that would protect future generations makes this explicitly clear. For its meagre contributions, Shell attempts to clean up its reputation by latching its name onto the arts and our cultural institutions. These creative protests are part of a wider campaign to stigmatise fossil fuels and challenge the ‘social license’ of oil companies, which allows them to keep pursuing ever more high-risk projects – like drilling for oil in the Arctic. On Wednesday morning, the gallery management might have hoped for some respite but were forced to close its main galleries, as members of the Public and Commercial Services Union took part in a nationwide strike over pay and privatisation. In London, many members gathered in solidarity with staff at the National Gallery, along with a representative from Art Not Oil, sending a clear message that privatisation plans were unwelcome. The decision by the gallery director to pursue privatisation is seen as particularly unpleasant, after he accepted a 20% bonus earlier this year of £28,000, on top of his salary of £140,000. The protesters remained vocal and creative throughout Shell’s ‘soiree of deception’, at one point dividing into 3-part harmony. For part of the evening, they also held a solemn vigil where those attending tied messages of solidarity to a Shell-branded exhibition banner outside the gallery and, one by one, shared their motivations for attending the protest. There were also chants in solidarity with the National Gallery’s PCS members, such as ‘Art for people not for profit’ and ‘Reclaim Rembrandt’. That morning, it had also been reported by the Daily Mail that members of the private security firm drafted in to watch over the exhibition were already letting standards slip: ‘They have been spotted touching paintings and even caught on camera in the Rembrandt exhibition stroking works loaned to the gallery.’ The headache caused by privatisation plans wasn’t about to go away. The National Gallery has previously drawn an ethical red line when it comes to its corporate sponsors. In 2012, following a successful campaign by the Campaign Against the Arms Trade, the arms manufacturer Finmeccanica pulled out of its corporate membership of the gallery a year before it was due to end. South of the Thames, the Southbank Centre ended its relationship with Shell last year following a campaign by several groups, including Shell Out Sounds. In both cases, the contributions made by the sponsors were small, while the legitimacy gained was big. 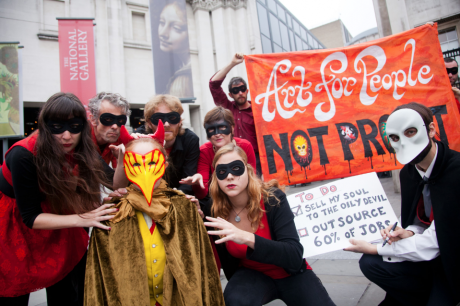 Last week, the National Gallery paid the price for its privatisation plans and deals with an oil sponsor. Members of the PCS Union are likely to take further action if there is no shift in the management position and the creative climate campaigners could yet return in novel new ways. But what the gallery might have unwittingly awakened is a new solidarity between environmental activists and union members, an allegiance that could easily spread to other institutions and halt corporate influence over the arts in its tracks.